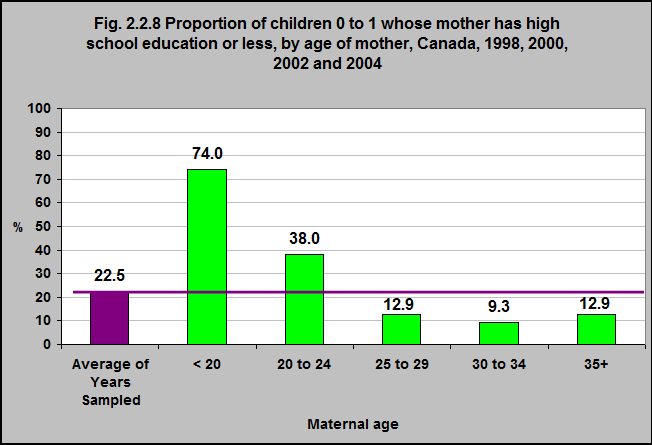 Source: CICH Graphic created using data adapted from Statistics Canada, 2008, “The Children of Older First-time Mothers in Canada: Their Health and Development”, Children and Youth Research Paper Series, Catalogue number 89-599-M. http://www.statcan.gc.ca/pub/89-599-m/89-599-m2008005-eng.pdf- July 19, 2017. When considering data from the combined years 1998, 2000, 2002 and 2004, less than a quarter of infants 0 to 1 had mothers with less than a high school education. The proportion of mothers with less than a high school education decreased with increasing age.